Teams who mastered the element of surprise. Many stories have a moment that finds our hero prone and struggling as the antagonist approaches. Just when things look darkest, the hero pulls out a surprise that turns the tide in their favour. It’s always a great, story-enhancing flourish. Surprise tricks (and picks) have been a hot topic in the LCS lately—just ask Counter Logic Gaming. CLG went up against Team Liquid in the quarterfinals, and won the first two games handily. 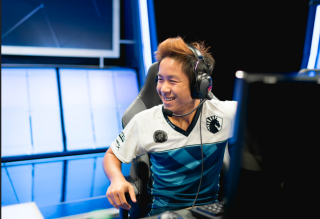 Just when things looked their darkest for Team Liquid, they pulled out a new, surprise ADC, one that they had been hoarding for a confrontation with TSM. Jynthe stormed the Rift and won Liquid a game, setting them up for a reverse sweep. Of course, this promise of a fairytale reversal didn’t quite bear out—CLG picked up the next game and ended the series. Despite the fact that Liquid’s last minute gambit didn’t turn out as they hoped, it sent a message, ignited Twitter, and even stunned the analyst desk. It takes an incredible amount of courage (or desperation) to pull out one of these picks, but the effects can be huge. In honour of Jynthe and Liquid, then, I wanted to examine some of the weird picks and surprise lock-ins and swaps of League history, and examine what makes them so effective. In order to discuss a ‘surprise’ pick, it’s time for a quick definition for the purposes of this piece: a surprise pick is not an ‘out of the meta’ pick that is considered a counter, i.e. Rammus in response to a triple AD counter. These picks can sometimes be called cheesy, and there’s certainly some overlap, but it’s a little more nuanced than that. Even when a champion like Anivia is outside of the usual picks for competitive play, if someone like Froggen locks them in—or someone else with a similar trademark pick—that doesn’t quite count either. Surprise picks break the meta, so far outside of the bounds of what is expected that the enemy team will be caught off guard. Obviously, it’s far easier to surprise pick a champion than a player, but Jynthe proves that you can do it with players as well. Surprising an enemy team requires a lot of work, and it can only rarely be pulled off. It requires that a team doesn’t show their entire hand in scrims, and even solo queue results can be analyzed. LemonNation’s Nautilus and Veigar support picks, both considered very unusual, were presaged by his spamming them with solo queue. Some players have been better at pulling out these shocking maneuvers and catching the enemy team completely off guard. While Kikis is now known for his steady, reliable top lane play, he drew TSM a card they didn’t see coming during IEM San Jose in 2014 with his jungle Twisted Fate. The Unicorns of Love were infamous for these strong picks, taking advantage of their opponents’ surprise, and steamrolling over them as soon as they stopped to stare. Keane is another player known for pulling stunts that throw off the enemy team. His unusual picks have earned him the title of the “anti-carry”—even when he doesn’t do good on a pick like Urgot mid, he makes the enemy even less efficient. Of course, I need to mention Inori. After Phoenix1 flamed out, the team rallied and had a perfectly respectable second half of the split, including taking a series off the otherwise undefeated TSM and winning a game against the Immortals. Rengar and Mordekaiser coming out of the jungle wasn’t the only reason they succeeded, but it certainly helped. The upsides of these picks are obvious—they can cause chaos for enemy morale, forcing them into playing a game they’re not prepared for. The cons are far more plentiful: it’s difficult to practice these picks without showing your hand and, of course, you can only surprise someone once. Surprises have lost their potency in the Best of 2 or 3 format. Consider that after Inori’s Rengar tore through TSM, TSM simply banned Rengar out; if Phoenix1 wasn’t able to put Inori on Rek’sai, they would have been in real trouble. When it comes to players, these problems become even more complex. Not only does all of the above apply, but you also have to spend resources on this pick. You have to pay them, scrim with them, split scrim time, etc. Many rosters experimented with ‘mix and match’ rosters; both Team Liquid and Apex talked about their 10 man modular rosters, with one team in Challenger and the other in the LCS. Cloud9 was a 6 man roster with Bunnyfuufu and Smoothie sharing the support slot. It’s understandable why players made this decision; they wanted to emulate SKT T1’s famous Faker/Easyhoon midlane tag-team. Not only could SKT adjust on the fly, leaving their opponents scrambling to catch up with the new strategy, but Faker and Easyhoon both had their own distinct strengths and weaknesses. In this current age of scrimming, strategy, and investing carefully into every tactical movement, it’s substantially harder to pull off a surprise pick that blows the enemy team away and gives you an enormous advantage. Phoenix1’s Inori and Team Liquid’s unorthodox ADC switch has proven that it’s not impossible, however. Not only do surprise picks throw off the enemy, but they also bolster the team and ignite fans. As the meta continues to shift heading into Worlds, we can hope to see some awesome, unexpected picks on the global stage. When teams get rolled over by these tactical decisions, they (and their fans) may be tempted to cry ‘cheese’. To which I answer with a classic joke: what do you call a quarter pounder with cheese in South Korea? A quarter pounder with legitimate tactics.